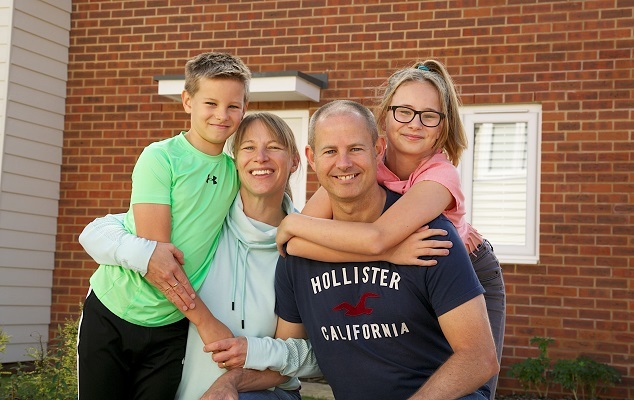 Andrei Netherwood was named after a famous fictional military man – and had an 11-year career in the Forces himself – but when it came to buying a new home, he was delighted to enjoy a nice, peaceful journey that has seen his family make their dream move in West Sussex. The 44-year-old public sector worker arrived at Bovis Homes’ Hampton Park location nine months ago with his wife Tamsin, 42, children Marissa, 11 and Ashton, 9, and cat Whisky, 18 – and they’ve all been enjoying life in this new part of the community ever since. Having previously bought a new-build from a different housebuilder in the county, Andrei and Tamsin, a paramedic, had pledged not to go down the route again after being less than impressed with the after-care service provided. However, that resolve was challenged when Andrei saw that Bovis Homes were starting to build their perfect property less than half a mile away from their old place in Littlehampton. Andrei, whose mum was reading War and Peace and the adventures of Russian soldier Prince Andrei Nikolayevich Bolkonsky during her pregnancy back in 1974, said: “This is our second new-build home and after the last time, we said we wouldn’t do it again – but this experience has been a much more positive one from start to finish. “We’ve had a great relationship with the Bovis Home team at Hampton Park – from Sales to Build to Customer Care – and that’s been key to a happy move. “We are not particularly needy people and we didn’t look upon buying a new home as an opportunity to start a fight with the builder, which seems to happen sometimes on social media. “I’m a big believer in finding things out for yourself and that’s paid dividends. We took a reasonable approach with the team, they took a reasonable approach with us – and if we needed something doing, it got done. The perfect property in question was a four-bed detached Canterbury house type which ticked all the Netherwood family’s boxes. “Living in a three-bed wasn’t working. We work shifts and we often have our parents staying over to look after the children, so it was vital that we had a big fourth bedroom with room for a wardrobe and double bed,” said Andrei. “I saw that Bovis were building, I went to their website, and the price was right. Then I took a virtual tour of the Canterbury, which was excellent, and then I just had to persuade the wife to go for a new-build again! Soon they were buying a Canterbury of their own, using Bovis’ own Home Exchange scheme, meaning a stress-free, chain-free, estate-agent-fee-free move.